Plants have to deal with a lot of environmental stressors. These include heat, cold, wind, drought and disease. That’s where liquid seaweed fertilizer comes in. Seaweed for plants has been used by gardeners and farmers for thousands of years. People collected it off the beach and put it right on their gardens as a seaweed fertilizer diy and mulch that quickly broke down, releasing dozens of minerals and vitamins and other beneficial components. When I lived near the ocean in Victoria, B.C., I would drive to a nearby beach to do the same. But nowadays I use liquid seaweed fertilizers instead, made from one of the most common seaweeds: kelp. Kelp for plants: from the beach, it’s a wonderful soil amendment, but when we don’t have it around, a seaweed liquid fertilizer still brings many of the same benefits. And a big advantage of these liquids over the solids is that we can spray them directly onto plant leaves for direct leaf uptake. When you do that, the plants still get that nice shot of dozens and dozens of different minerals and vitamins. But the main benefit of liquid seaweed is the natural plant growth regulators and hormones it contains that help plants grow faster, healthier and stronger. And one of the main things they do is help plants deal with those environmental stressors. 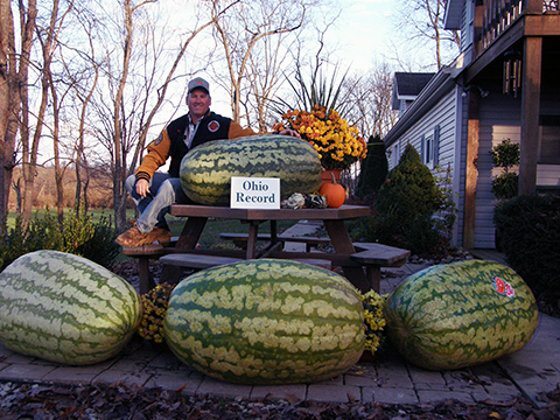 These record-breaking watermelon were grown with my liquid seaweed fertiliser and liquid fish. Probably the most important of seaweed fertilizer benefits is that it’s the best when it comes to boosting plant health and helping plants deal with environmental stressors such as heat, cold, wind, drought and disease. Like all of my organic fertilizers, it can have a big impact on boosting plant growth, but I often think of it as really excelling at promoting healthier plants. Using seaweed as fertilizer also increases overall nutrition, including protein content (we’ve lost a lot of protein in our crops in the last 50 years). 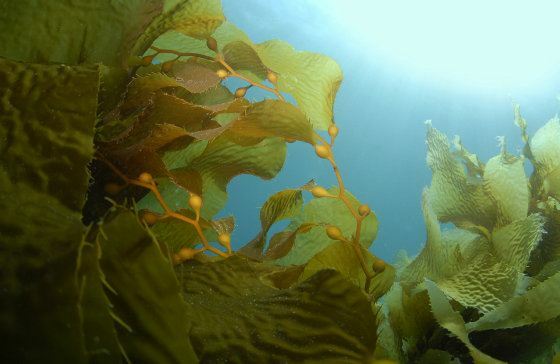 His research showed not only the kelp fertilizer benefits for plant health and growth, but also that a quality liquid seaweed can help control insect pests such as spider mites. Who Needs This The Most? The reason I recommend this to everyone is because it really is helpful in most gardens. It doesn’t necessarily give the big boost in plant growth that some products give, but it really boosts plant health, which helps discourage pests. It’s just a nice piece of preventative health care to bring into the mix, and at times can be a quick cure for various ailments a plant may face. That’s why organic farming consultants often recommend it be included in any spray application regardless of what else is being used. How to make seaweed fertilizer: if you live near a beach with some seaweed on it, you can just take that and use it directly as a seaweed garden mulch, provided it’s legal in your area to remove it. Be sure to leave some for the beach, though, as it has a big role to play there as food and habitat for many different species. Or if you want to make a basic liquid seaweed fertilizer, pack the seaweed into an airtight container and fill it with water. You don’t have to rinse off the salt first. Let it sit for at least a couple of weeks (or more like a couple of months in cold weather). It smells quite bad because it’s an anaerobic fermentation, but that’s okay. Adding a bit of SCD/EM into the water can cut down on that. When you’re ready, mix it with 10 parts water and spray it directly onto your plants. It’s not nearly as concentrated as a professionally manufactured kelp fertiliser, but will still have many benefits. If you let it sit long enough, the seaweed will probably decompose and dissolve, but if there’s any left, you can still throw it onto your garden as a mulch. Some seaweeds can grow over 2 feet per day. There are several species of seaweed that are commonly used for fertilizer. There are debates as to which one is best, but the similarities are far more important than the differences, so when you’re looking for a seaweed garden fertilizer, my view is to not worry too much about the species. What’s more important is that the kelp plant food be processed without heat and high pressure, so as to keep as many of the beneficial components in tact, and also without toxic chemicals like potassium hydroxide and sodium hydroxide. Most seaweed fertilizers use one of these caustic chemicals along with high heat and pressure, but we want an organic seaweed fertilizer that’s processed at cooler temperatures without chemicals. Even some of the organic products, like the popular Maxicrop liquid seaweed, are processed in such a way that they don’t retain near as many of the natural growth regulators and even the beneficial microbes. That’s not to say products like that wouldn’t have any benefit, but they’re definitely not the same quality. The other thing to think about is whether the manufacturer is sustainably harvesting the seaweed, because overharvesting is becoming an issue. That can be more difficult to figure out. What I do is contact the manufacturer to ask what they’re doing to make sure their process is sustainable. If they have a good answer instead of brushing me off, that’s a good start. Then I go to the internet to see if anyone else has any more info on the company. I would like more solid info that that, but seaweed harvesting is not an issue under public scrutiny at this point, even by environmental organizations, so I kind of have to go with word of mouth. 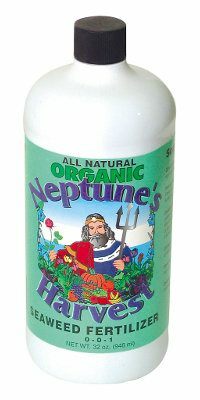 The liquid seaweed fertilizer I use is from Neptune’s Harvest, cold processed and organic. I did some digging and found that it’s made by Thorvin, one of the best seaweed manufacturers in the world when it comes to quality and sustainability. In terms of quality, they dry the seaweed at low temperatures using geothermal energy in order to retain the nutrients and preserve bioavailability. In terms of sustainability, they harvest in a geographically remote location in very clean water, away from agricultural run-off and commercial shipping. They also rotate harvests to allow for sufficient regenerative growth. Use 1 quart per 1000 square feet annually. So I use 1/2 cup of liquid seaweed fertilizer per 1000 square feet every month for 8 months. Mix it with at least 50 times as much water, which is 1/3 cup (5 Tbsp) per gallon of water, or 1.5 gallons of water for each 1/2 cup of fertilizer. It goes great with any other liquid product, which is why it ends up in my mix every month. Liquid seaweed is great mixed with liquid fish and molasses/dextrose. It also goes well with EM, compost tea and mycorrhizal fungi. You can soak/spray your seeds and root balls to improve germination and early root growth, and decrease transplant shock. Do that at the same ratio above. I often soak seeds overnight before planting. When you buy this liquid seaweed fertilizer, you get enrolled into my online Biostimulants course. The course includes 10 videos totaling about 75 minutes where I chat about seaweed, fish, sea minerals, molasses/dextrose, rock dust, and how to use them all. If you have a question about this product, leave it in the comment section at the bottom of of this page and I'll try to respond within a few hours. Dry fertilizers and compost tea brewers ship for free, separately with USPS instead of UPS, so they will arrive on their own maybe a day or 2 apart from my other products. I ship in the U.S. only. Products ordered by 2pm will ship same day. After that they ship next day. Weekend orders ship Monday. All of my products have a 1 year 100% money-back guarantee. With every order, I send $1 to Organics 4 Orphans and other similar organizations. O4O is working with the world’s poor to help them grow organic, highly nutritious, highly medicinal food for themselves, and then use the surplus food to generate income for themselves as well as feeding the orphans in their communities. My hope this year is to again send $1500US, which is enough to start projects in 25 new communities! Provides many benefits, but is especially known for improving plant health and helping plants deal with heat, cold, wind, drought and disease. Is manufactured sustainably, without heat and pressure and caustic chemicals, therefore providing much more benefit than other brands. Is organic (not OMRI-Listed but meets requirements for NOP), and undoubtedly one of the most popular organic fertilizers available. As a free bonus when you order today, I’ll also enroll you in my online Biostimulants course. Just choose your container size and click ‘Add To Cart’ up above! Early this morning, I sprayed my zucchini with this liquid seaweed, sprayer set at 5T per gallon. Now the leaves look damaged. The edges look spotted and slightly wilted. They looked great before. Is this common? Did I miss a directions? Hmmm, I’ve seen some damage with the fish before – never with the seaweed. On the bottle they say to mix it 1:128, which is more like 2Tbsp per gallon of water, but on their website when I look at the application procedure in more detail, they often say 1:10, which is like 25Tbsp per gallon of water. I’ve always done 5Tbsp with no problems, although it never hurts to use more water. I’m very sorry for your troubles Elizabeth. Zucchini leaves are pretty tough – I bet they’ll recover soon. The leaves developed symetrical markings which persisted, but the plants looked wonderful in posture, seemed really happy. Things went fine from there. Wish the season weren’t ending soon. It could be if you didn’t dilute it enough. Dilute at least 50 times (at least 1 gallon of water for 5 Tbsp of neptune’s harvest. What should I use for a soil that has virtually no Nitrogen and very little Phosphorous? Compost or composted manure is probably first. Fish meal and/or liquid fish ( https://www.smilinggardener.com/sale/liquid-fish-fertilizer/ ) may be next. Guano is good too, but can be expensive. I’d go with good compost and fish meal. I live in Wisconsin so I can’t harvest fresh seaweed. What is the best Kelp/Seaweed you can purchase online? Thanks for any info. I know Neptune is ok but are there better options? I’d say the best overall value is Neptune’s Harvest, which is why I’m selling it on this page. They’re using Thorvin seaweed, which is one of the best in the world. This is hilarious. I have just moved from Victoria, BC and now live on Crete Greece. Trying desperately to find a source of orgnic liquid seaweed fertilizer. Don’t suppose you ship to Greece do you? If so, what would the cost be? The product I am looking for is to be used on organic hydroponic vegetables. I wish I had left all my clothes out of my cases and just brought gardening supplies instead! Sorry Olwyn, I can’t ship overseas. There must be someone in Europe who can help. Curious how often you spray your plants in particular vegetables. I do everything monthly, which is great, although I would do weekly in very small amounts if I had the time. I use organic wow soluble kelp powder. Is it different than liquid seaweed? Which is more beneficial liquid seaweed or powder seaweed? It’s different but they’re both good. I use liquid because it’s ready to use and also because it’s made with fresh kelp instead of powdered kelp. But the powdered is still beneficial. I’ve never seen any research comparing the two. Thank you for the prompt reply. I’m interested to use both and check myself which makes difference. Absolutely. For houseplants, use 1 tablespoon per gallon of water every 1-2 weeks. Sea minerals fertilizer has 80+ nutrients that are immediately available to plants, and a big benefit of the product I use is that it has an organic component (dead and living) that may be just as important as the nutrients. What it doesn’t have is much N-P-K, but it's still been proven to vastly increase yields and nutrition. Seaweed fertilizer has most of those nutrients, too, but much less of them and also not much N-P-K. Where it’s unique is in the plant growth hormones it contains that supercharge many plant processes. It's main benefit is boosting plant health, helping plants deal with stress from extreme heat, cold, wind, drought and disease. Fish fertilizer also has most of those ocean nutrients, but much less of them like seaweed, although it contains much more N and P, plus whole proteins and fats. It’s not as easily available to plants as sea minerals and doesn’t have the natural growth hormones of seaweed, but is still very useful. Seaweed is the most popular, and is often my first recommendation, although it doesn’t supply all that much nutrition on its own. Seaweed and fish have been applied together for a long time - they’re a winning combination. Of the 3, the sea minerals and fish are most similar to each other, and when you factor in the application rate, the sea minerals is a better deal and much more sustainable. I actually use all 3, but just less of them, so by the time I’ve gone through all 3 bottles, it doesn't cost me too much more than if I were using just 1 of them - but doing it this way, I receive the benefits of all. "Products working out great...several days after applying EM/seaweed, one languishing pumpkin took off so quickly that in all seriousness I did a double take to make sure I got the right plant. No coincidence, never experienced this before. Seems everything is more green, and happened quickly....family noticed too!" "I have only sprayed twice and I can see such a difference already! I just inherited an orchard with the purchase of our new home. The trees are sick and I am sure it is from the overuse of chemicals and fertilizers having been sprayed for at least a decade. I have healthy new shoots prolifically growing from very sick trees. I am so excited to see if i can turn the orchard back into a healthy place. Also, I found the information on this site very informational, and ordering process so simple (and fast!). I am so lucky that I stumbled upon this site." "I've been using the regimen of EM, kelp and sea minerals/fish on a weekly basis and I've never seen anything like it! A couple of the tomato plants are about 9 feet tall with virtually no yellow leaves all the way to the bottom of the plants. I even had to hammer in a 10 foot stake the other day to keep them upright!" "My San Marzano tomatoes were suffering from blossom end rot. I read that BER is caused by uneven watering and/or calcium deficiency. I suspected that something was preventing the absorption of the calcium, or the plant was suffering because of our watering restrictions (we're in Long Beach, California). So I put a bit of your EM in the watering can and prayed. Not kidding: every tomato that developed and ripened since the EM application showed no blossom end rot! I'm sure it was the prayer! :-) Thanks for all you do, Phil!" "I think it is a great thing you do, that's why I bought the products from you....purely to support. We have great gardening supplies all over NYC. But your cost is also very affordable. You are....AWESOME!" "Phil, your products I purchased from you are great! I used them immediately after receiving them and have seen a marked change in my plants. Thanks for checking in with me, that does mean a lot. I've never had anyone to do this before. Thanks again Phil, you're a great guy!" "Thank you for the timely delivery, the wonderful customer service, the great products AND most of all your SUPERB gardening advice and encouragement. I am a fan." "Wow thanks Phil. I did not expect the kind of service you are providing. I also do a lot of internet "schooling" of my customers as I am a cycling and triathlon coach. Your level of service parallels that provided by some of the best coaches I know. Thanks." "Everything I see from you is right on the mark in my opinion - very impressive. I would not hesitate to recommend you to anyone interested in growing more nutritive food." "I was applying (once a month during March/April) a cocktail of 1/2 cup each of liquid seaweed, BioAg and Molasses with my Gilmour hose-end sprayer set on 1 tablespoon. Even though it's still early in the season, my plants are responding very well. We haven't seen this much healthy growth EVER in our yard." "I've been using most of the products this season and the results are like nothing I've ever seen, even just 6 weeks after transplanting from indoors!" "Want to thank you for helping me improve my organic gardening skills and knowledge. I got your 15 lessons, downloaded you ebook and started using SCD Probiotics and mycorrhizal fungi. My garden has thrived this year and I love the idea of growing more nutrient dense food." "EM has made a huge difference in my veggie garden. Wow! I love it." "I gave my starving zucchini some compost tea before I went to bed last night. I woke up to find them perky and very happy looking. Amazing!" "You are absolutely amazing! Thanks for sharing your wealth of information and research. I really enjoy your videos and now consider you my #1 source. I am just 'figuring' this all out and have made my share of mistakes along the way but I feel like I have a clear road map now for the basic organic fertilizers, etc. My order arrived promptly so I would order again from your site. Again, I really enjoy your educational style and depth of knowledge!" "The endomycorrhizal fungi that Janice and I got from you last month has been incredibly effective. I'm particularly surprised by how quickly roses react to it. After inoculation, the roses I treated dropped all their diseased leaves and flushed out in new healthy growth. I've treated my own plants and several client 'rose gardens' now with the same encouraging results." "We have been using your products since the beginning of the summer and we are having good results. Thanks so much." "I received my order and was quite impressed by the quality of product and service. It is apparent to me that this gardeners pantry is about more than profits; a rarity in our world today. I'm sure I will be doing business with you once again." "I'd bought some sickly looking plants on sale with yellowish leaves & within 2 days of using the EM the leaves turned a much healthier shade of green. Inside of a week they were back to 100% healthy. I can't say enough good things about EM." "Well it's 2:00pm Aug 30 and I got my order. That's less than 24hr service -- great. Will keep you in mind for additional items." "This year my tomatoes have seemed to be 'stalled' in growing, and I planted very late which was already trouble in the brewing. I transplanted them to a more sunny area and applied your ocean fertilizer, which has them looking alive and they have grown about 3-4" already having applied the liquid seaweed a day after delivery. Thank you for the product. I may have tomatoes in September, thanks to Sea Crop and the fish fertilizer." "I did receive your products and will be using them in a few weeks to start seeds. Meanwhile. I put some Seaweed, Humic, Molasses and EM in with the watering of my house plants, WOW!! What a difference!" "I want to praise Phil for following up on my recent order, which hadn't arrived yet when he sent me an email. He found the delay at UPS, re-sent the order with expedited shipping, and added a free gift, when the delay wasn't his fault in the first place. I will always buy my garden and orchard supplies from Smiling Gardener in the future. THANKS, Phil!" "We started mulching Oct 2009 on soil that was about 80% sand. The increase in growth and biodiversity have been incredible. Our only additions to the mulch have been seaweed (yearly), EM solution (1st spring) and endomycorrhizae (to individual plants)." ""The smiling gardener is the Premier outstanding resource for high quality products at a great price. The best I have found so far. The clear information provided in the videos and on the website are a tremendous resource for our gardens well being. Thank you Phil for providing such a premium product resource and information, which when applied has the potential to restore the earth and humanity to our original pristine paradise. And thank you everyone here that uses these products, tools and methods of caring so much about the future of our Mother Earth. May the great gods of the goodies and gardens smile upon you, for the extreme dedication and devotion to our soil, plant, and animal friends. It's a 10 star out of 5 rating"
"Thank you for this GREAT info packed website! I bought the Beginners Kit and my patio garden is SO happy!! I harvested lettuce, two kinds of kale, and cilantro after planting them 18 days ago. Best salad ever!!! I look forward to seeing how the rest of this year works out in my patio garden!! The first two years the yield was inconsistent, lots of pests, and I lost interest after two months. Lots of money, effort, and hopes down the drain. Not this year! Plants are growing right before my eyes it seems so I’m taking photos once a week to compare results." "THANK YOU for the unbelievably effective products you offer. Finding your website has been the best thing I've ever done to finally get rid of nasty gnat and variety of pest infestations and to finally grow a healthy amazing garden. Over the past 10 years, I had tried every product you can imagine to battle against gnats and variety of pests but nothing worked more than a day. With one week of using your few products, Bio Ag, seaweed etc. they’ve vanished and I have the most beautiful garden in the Neighborhood. I’ve already learned so much about organic gardening and look forward to continuing with studies in your academy. It’s worth every penny. You are a miracle. Thank you for what you are doing to save our beautiful planet."